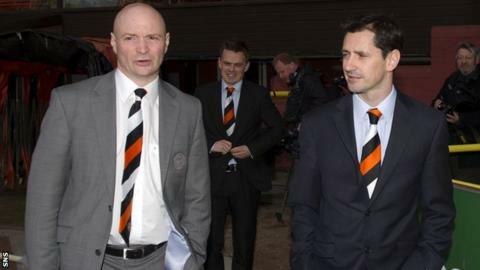 Dundee United chairman Stephen Thompson hopes Rangers can "come on board" along with all other clubs in order to progress the Scottish game. with the visitors having not taken up their ticket allocation. That measure was taken after United's opposition to Rangers being in the Scottish Premier League this season. "Personally for the sake of Scottish football, I think we should move on," Thompson told BBC Scotland. McCoist echoed Thompson's comments that it was time to "move one"
"It's a game of football after all. That's what I'm looking forward to. "We are in the middle of reconstruction talks and the game is moving forward. "We have got all SPL clubs together to move forward for the future and I think we all need to get together, every single club in Scotland, and it would be good for them [Rangers] to come on board as well." United were not alone in voting against Ibrox chief executive Charles Green's application to take over the SPL share Rangers lost following financial problems but the Glasgow club's fans regarded Thompson as one of the most outspoken figures on the issue. "I'm disappointed because it's a big game for both clubs and would have been a full house," said Thompson, who appointed Jackie McNamara as the club's new manager this week. "They have made their decision, they are entitled to do that and I wouldn't like to enter into that kind of discussion. "I was on the SPL board at the time when things arose. The other clubs didn't put them in the position they are in. "It's up to their own fans to decide how they got where they are. I don't want to re-write the history books either." Rangers manager Ally McCoist feels the time has come to "take the sting out of the whole situation". "The club have taken the stance not to take any tickets for the game," he said. "That stance has been made and hopefully it's just a one-off and we can move on." Meanwhile, Thompson revealed there will be around 300 Rangers fans at the game with "very strict security measures being put in place inside the stadium and outside". "We are quite happy everything will be fine," he added.